QUITO, Ecuador, and BOGOTÁ, Colombia — In recent years, mayors from around the world increasingly have been arguing that they deserve a more prominent role in international policymaking. But over the past few days, in meetings in both Quito and Bogotá, they’ve made the case in their most forceful terms yet. On the eve of the U. N.’s Habitat IIIconference on cities in Quito, some 200 mayors and delegations from 500 cities released a manifesto called “A Seat at the Global Table: Local Governments as Decision-Makers in World Affairs.” The 10-point document argues that, compared to national governments, municipalities are the closest to everyday citizens and know the needs of their cities more intimately than national-level bureaucrats. A more detailed document called “The Bogotá Commitment” emerged from a meeting of the United Cities and Local Governments network held last week. That paper lays out a series of specific, often inventive ways that local governments can contribute ideas and play a role in the global debate on a more sustainable urban future. The subtext of both texts is a growing feeling among the world’s mayors that dealing with the world’s most complex issues, such as fighting climate change and poverty, require coordinated solutions at the global and local levels. Mayors and other local authorities have been among the most active constituencies in the run-up to this week’s Habitat III conference. But as preparations have taken place for Habitat IIIand the 20-year strategy that it will finalize — known as the New Urban Agenda — local authorities have been frustrated by a lack of a formal role in defining the details of that agenda. “A Seat at the Global Table” focuses particularly on the implications of the fact that cities are growing in both population and economic prosperity. Yet in many countries, national governments continue to hold power over key aspects of urban development. The manifesto says that needs to change. “The global governance system is no longer adequate to address the existing challenges the world is facing,” the document states, “because these challenges are at the same time more global and local”. So what’s needed? The document calls for a “paradigm shift in global governance” via a strengthened role for local governments at the international level — specifically within the United Nations, where local governments are considered NGOs rather than spheres of government in their own right. After Habitat III, the manifesto says, local authorities need to be allowed to “coordinate policies, programmes and projects” related to urban development. To achieve this goal, local governments are expected to professionalize their international-relations capacity, the document states, while national governments are expected to serve as “allies” by passing enabling legislation. The mayors’ call appeared to have the backing of a key figure: U. N. Secretary-General Ban Ki-moon. In Quito on Sunday, Ban acknowledged a “widely recognized need to support and empower local governments”. “Decentralization and devolution of roles and responsibilities for local and regional authorities is an important trend,” Ban stated, emphasizing to the mayors in attendance that “your role is growing by the year”. A central aspect of the Habitat III discussions and the text of the New Urban Agenda has been an attempt to reorient decades of development policy that has looked at urbanization as an inherently negative thing. Rather, there’s now general agreement that urbanization done correctly can reverse trends toward inequality and environmental degradation — and local leaders have a key role to play in this. Again, Ban appeared to concur. “Mayors, governors and councilors are at the forefront of the battle for sustainable development,” he said. “You are faced with the immediate daily demands of your people … Local and regional governments are now seen as key partners to implement their development”. However, experts in local governance do not think such a power shift will happen without a fight. “It would be naive to think that the nation-state will sit by idly as cities and mayors try to insert themselves in global conversations on their own terms,” said Diane Davis of Harvard University, reacting to the details of the new manifesto. “The problem with the focus on the great potential of empowering mayors is that such arguments do not take into account push-back from national-level actors who also want to preserve their powers,” she said. Still, others see hope in the mayors’ assertiveness. Local leaders around the world are increasingly talking to each other directly to boost city-to-city trade and to borrow innovative policy ideas from each other. Last month, the inaugural “Parliament of Mayors” even sought to set up a separate global policy-making body made up solely of local authorities. “During the preparatory process toward Habitat III, local governments have managed to create the conditions for a turning point,” said Cristian Espinosa, international-relations adviser for the City of Quito. “If you reach the crest of the wave, that is important when you are surfing. But more important is what you do after the crest — you continue to surf. Habitat III allows us to say we’ve climbed to the crest. The surfing begins only after”. “A Seat at the Global Table” is light on details, mostly declaring broad aims and principles. “The Bogotá Commitment”, however, is rich with specifics on what mayors and local authorities can do to put cities at the center of a more sustainable global future. It also dubs Habitat III “a moment of unprecedented opportunity” to identify more responsive governance models. Local and regional planning: The UCLG formula not only proposes using land-use plans and regulations as tools to curb urban sprawl, but also offers specifics — creating mixed-use areas that integrate housing, commerce and offices to form coherent, non-sprawling communities, with roadways and transit routes laid out well in advance of new development. Right to the city: The paper also proposes that policymakers put the “right to the city” at the centre of urban and regional governance. This concept — whose inclusion in the New Urban Agenda was one of Habitat III’s biggest controversies — leads local authorities to struggle against new forms of poverty and injustice by working with communities to upgrade slums and regenerate poor neighborhoods. It also means ensuring a right to basic services for newcomers to cities, including migrants and refugees. Low-carbon transition: “The Bogotá Commitment” proposes a new status for local authorities in the United Nations as a strategy for discussing and crystallizing methods for low-carbon, sensitive town and regional planning on a worldwide scale. The broad goal is to “lead the transition toward low carbon, resilient cities and regions,” and do so through an array of steps — from renewable energy to reducing the urban ecological footprint of cities, from promoting urban agriculture to advanced forms of disaster-risk reduction. City-level innovation: Finally, the paper includes a sort of political self-improvement test, urging “an enabling environment for local and regional governments — where local and regional governments can experiment, innovate and capitalize on their resources and potential”. If private industries prosper through experimentation, why not the governments that have the power and responsibility to set the stage for our own cities and neighbourhoods? 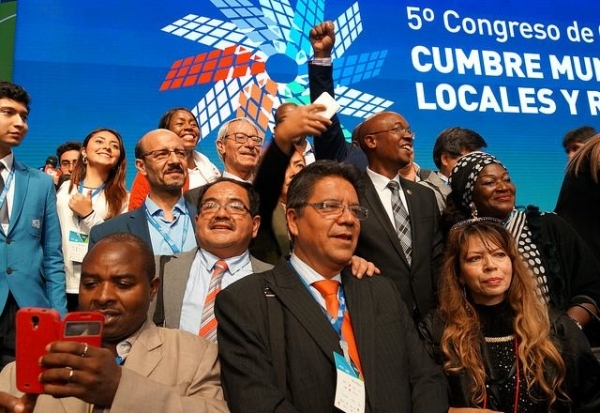 The Bogotá meeting also saw a new figure elected to lead UCLG. Parks Tau, the former mayor of Johannesburg, won a contested election to head the worldwide organization of local government officials. Tau won 105-42 over Ilsur Metshin, the mayor of Kazan, Russia. In August, Tau lost a reelection bid for mayor when an unusual political coalition overturned the long-dominant African National Congress. But he continues to hold a seat on Johannesburg’s city council. At the UCLG vote, the wave of support for Tau — particularly from African mayors as well as from Mayor Anne Hidalgo of Paris — indicated recognition of him as a promising African political leader with a clear grasp of cities’ growing role and recognition worldwide. Tau succeeds Istanbul Mayor Kadir Topbas in the UCLG presidency. The significance of his election, Tau told Citiscope, relates to the challenge of local governments assuming a key role in implementation of New Urban Agenda as well as the Sustainable Development Goals (SDGs), the landmark framework adopted last year by the U. N.The New Urban Agenda is seen as an important roadmap for local implementation of theSDGs. Farley Peters contributed to this report.